PURPOSE: This study investigates physiologic vital signs in subjects, with and without cerebral pathologies, undergoing ultra-high-field (UHF) 8T MR imaging. METHODS AND SUBJECTS: Eighteen normal subjects and 74 subjects with cerebral pathology consented for 8T UHF MR imaging. T2*-weighted gradient-echo and T2-weighted rapid acquisition relaxation excitement sequences were used. Physiologic vital signs measured included systolic blood pressure, diastolic blood pressure, mean arterial pressure, electrocardiogram, heart rate (HR), respiratory rate (RR), and pulse oxygen saturation rate. They were collected before, during, and after imaging. Mean vital sign values at different stages were calculated and compared. Subjects were interviewed after imaging. RESULTS: No adverse vital sign change was detected. Statistically significant changes after imaging included a HR decrease from 65.2 beats per minute (bpm) to 60.3 bpm (P = .001, paired Student t test) in the normal group and a RR increase from 14.5 respirations per minute (rpm) to 15.1 rpm (P = .001, paired Student t test) in the patient group. Transient vertigo sensation was reported by 27% of normal subjects and 11% of subjects with cerebral pathologies. One normal subject and one subject with cerebral pathology reported an episode of nausea and vomiting. CONCLUSION: The current neurologic human MR imaging procedure at 8T UHF has no serious adverse effects on major physiologic vital signs in either normal subjects or patients. Transient vertigo, nausea, and vomiting were identified as potential risks. Despite the FDA ruling, the goal of this study is to add to the existing set of safety data by examining physiologic vital signs and sensations in human subjects undergoing imaging at 8T field strength. Both normal subjects and subjects with neurologic disease were examined. In this manner, the combination of strong magnetic fields, oscillating gradients, and RF pulses in the 8T environment can be further characterized in human subjects. From October 2001 to October 2004, 92 subjects (66 with histopathologically confirmed brain tumors, 8 with confirmed cerebrovascular diseases, and 18 normal subjects) consented to 8T UHF MR imaging under 3 different research protocols approved by the institutional review board. A standard pre-MR-screening questionnaire obtained from each subject was used to exclude subjects with MR-sensitive foreign bodies or implants. Subjects were also excluded if their baseline vital signs fell outside a predetermined normal physiologic range. This range included core temperature ≤38°C, respiratory rate (RR) between 12 and 20 respirations per minute (rpm), systolic blood pressure (SBP) between 90 and 160 mm Hg; heart rate (HR) between 50 to 90 beats per minute (bpm); and oxygen saturation >95%. Subjects were also excluded if they experienced claustrophobia during initial placement of the TEM coil over the head. Imaging was terminated if any vital signs fell outside the above physiologic limits or subjects refused to continue. Vital signs were collected at 3 different stages: before, during, and after MR imaging in the presence of a licensed physician. The subject was supine during all vital sign measurements. An MR-compatible automatic Omni-Trak 3100 (Invivo Research, Orlando, Fla) remote monitoring system was used to monitor vital signs during the whole procedure. This included SBP; diastolic blood pressure (DBP); mean arterial pressure (MAP) through a blood pressure cuff on the subjects’ arms; HR; and pulse oxygen saturation through an index finger oximeter. These vital signs were measured at a 5-minute interval before imaging and 15-minute intervals during imaging and immediately after imaging, respectively. In addition, RR was counted visually, core body temperature was recorded by using an infrared thermometer (LightTouch, LTX-1), and 2-lead precordial ECG was recorded before and after imaging. A pair of ear plugs was used to dampen acoustic noise originating from the magnet. After imaging, each subject’s comments on the procedure were documented by 3 consecutive questions in a short interview: (1) How did you feel during the study? (2) Did you experience any unusual sensations during the study? (3) Any other comments? During this interview, we specifically asked subjects whether they experienced sensations of coldness, numbness, focal heat, muscle tingling, noise, hallucinations, dizziness, gustatory sensations, nausea, or claustrophobia. Subjects were placed supine on a cantilevered table and were instructed to keep still during the imaging procedure. The cantilevered segment of table was advanced into the magnet’s bore for a 3-minute period. The scanning procedure consisted of 2 MR images: T2*-weighted gradient-echo (GRE) and T2-weighted rapid acquisition relaxation excitement (RARE). Typical parameters for GRE were TR/TE, 675/12 milliseconds; flip angle, 22°; matrix, 1024 × 1024; section thickness/gap, 2/3 mm; field of view (FOV), 20 cm; 17–21 sections; RF pulse, sinc3; RF pulse width, 6 milliseconds; acquisition time, 11 minutes 32 seconds. For the RARE sequence typical parameters were as follows: TR/TE, 2000/28.6 milliseconds; flip angle, 90°; matrix, 512 × 512; section thickness/gap, 5/6 mm; FOV, 18–20 cm; 7–10 sections; RARE factor, 4; RF pulse, sinc3; RF pulse width, 8 milliseconds; acquisition time, 5 minutes 12 seconds. Imaging parameters did not vary substantially from subject to subject. Some subjects underwent imaging in multiple planes, which prolonged the duration of the entire imaging study. The SAR of GRE and RARE sequences in the present study were 0.086 W/kg and 0.95 W/kg, respectively.20 After scanning, subjects were removed from the magnet at the same rate as advancement to avoid the influence of fast movement within the magnet. Each subject’s duration within the magnet, from entering to exiting of scanner room, was documented. SAR, gradient field rate changes, and sound pressure were well within the FDA criteria for no significant risk. The scanner room was air conditioned at a constant 22.4°C, and subjects were covered to keep warm. The temperature within the bore of the magnet was 16.4°C. This lower temperature was most likely the result of gradient cooling. Between each acquisition, the subject was encouraged to verbally communicate with the investigator and was informed of the pending acquisition time. 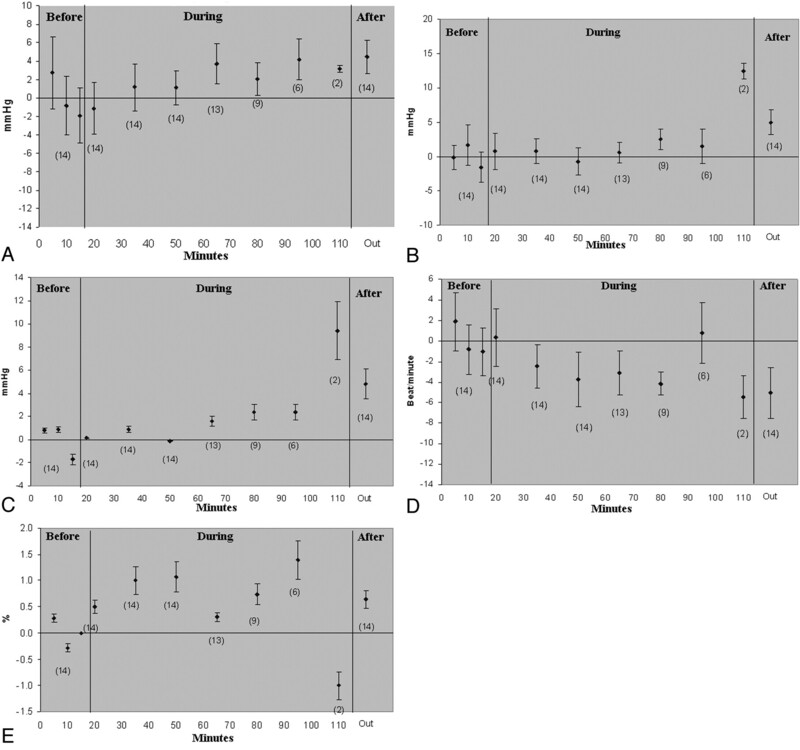 The mean vital sign values obtained before and after imaging in normal subjects and patients were calculated and analyzed, respectively by a paired Student t test. Changes in vital sign values before and after imaging were calculated and the values derived from each group (normal subjects and subjects with neurologic disease) were compared by Student t test by using JMP 5.1 (SAS Institute, Cary, NC) statistical software. A P value <.05 was regarded as significant. Changes in vital sign measurements obtained at all 3 stages of imaging were graphically displayed and reviewed relative to preimaging baseline values. The mean value of vital signs for each group before imaging was calculated and set as the baseline to track any trends for vital sign fluctuation during the procedure. Change in a vital sign was defined as the difference between the vital sign measurement at each time interval with the baseline measurements obtained before imaging. Mean values of vital signs obtained before, during, and after scanning were also calculated and compared by using one-way analysis of variance (ANOVA). A total of 7 subjects (all from patient group) were excluded before imaging. Among them, 3 were excluded because of claustrophobia upon initial placement of the TEM coil and 4 were excluded because vital signs fell outside the normal physiologic range before scanning. During the study, one subject with a brain tumor discontinued the examination because of claustrophobia, and another patient with a brain tumor abruptly left the scanner during the scanning because of anxiety and subsequently experienced nausea and vomiting. Vital signs did not fall outside the normal physiologic range in any of the subjects who were imaged. Finally, a total of 83 subjects completed the imaging procedure. This included 65 subjects with neurologic disease (57 subjects with brain tumors and 8 subjects with cerebrovascular disease; male:female, 32:33; mean age, 45 years; age range, 20–70 years;) and 18 normal subjects (male:female, 11:7; mean age, 36 years; age range, 20–56 years). In addition, the full set of measurements at 3 stages were available only in 14 normal subjects and 46 patients because one of the research protocols was amended after some subjects had been scanned without vital signs obtained during scanning. The Table displays the mean values and changes of vital signs (HR, RR, core body temperature, oxygen saturation rate, SBP, DBP, and MAP) before and after imaging in 2 groups, as well as the result of intergroup comparison. The mean duration of normal subjects within magnet in this group was 69 ± 18 minutes. Among all vital signs recorded before and after imaging in all 18 subjects, only HR significantly decreased from 65.2 bpm before imaging to 60.3 bpm after imaging (P = .001, paired Student t test). All others were in normal range with no statistically significant changes (Table). The change of each vital sign measurement relative to the before imaging baseline at the 3 stages during the procedure in 14 normal subjects is displayed in Fig 1. Among 14 subjects, 13 remained in the magnet longer than 45 minutes, 9 staying longer than 1 hour. The longest duration in this group was 90 minutes in 2 subjects. Visual inspection of the graphs indicates a very mild increase in SBP, DBP, and MAP as well as a decrease in HR during scanning. All vital signs fluctuated around the baseline at 3 stages with no significant change (P < .05, one-way ANOVA) compared with mean values of vital signs obtained before imaging stage. HR in these subjects decreased from 64 bpm before imaging to 62 bpm during imaging, further to 59 bpm after imaging. Temporal change of vital signs relative to a baseline values, before, during, and after imaging in 14 normal subjects. Mean values are indicated as solid diamonds with standard error bars. Y axis values indicate the change in the vital sign value relative to baseline mean obtained before scanning. Numbers in parentheses indicate total number of subjects at corresponding time spots. A, SBP; B, DBP; C, MAP; D, HR; E, O2 saturation. The mean duration of patients in this group within the magnet was 29 ± 10 minutes. Among vital signs obtained in all 65 patients, only RR increased significantly from 14.5 rpm before imaging to 15.1 rpm after imaging (P = .001, paired Student t test). All others showed no changes and fell within normal range (Table 1). Figure 2 displays the difference of each vital sign measurement obtained before, during, and after imaging relative to a before imaging baseline measurement. Most (41/46) imaging procedures finished within 45 minutes after patients were placed into the magnet. No significant change of vital signs (HR, oxygenation saturation, SBP, DBP, and MAP) was identified in these patients during and after imaging relative to preimaging values (P < .05, one-way ANOVA). Temporal change of vital signs relative to a baseline values, before, during, and after imaging in 46 subjects with neurologic disease. Mean values are indicated as solid diamonds with standard error bars. Y axis values indicate the change in the vital sign value relative to baseline mean obtained before scanning. Numbers in parentheses indicate total number of subjects at corresponding time spots. A, SBP; B, DBP; C, MAP; D, HR; E, O2 saturation. The mean values of vital signs changes in both groups (18 normal subjects versus 65 patients) before and after imaging were compared and only HR change was significantly different between 2 groups (mean decrease of 4.8 per minute in normal group versus mean decrease of 0.3 per minute in disease group, P = .006). All other vital signs changes did not differ significantly (Table 1). No change was identified on ECG pattern before or after scanning in either group. After the imaging procedure, 3 consecutive questions were asked in a short interview and subjects’ comments were documented. Overall, 13 (72%) of 18 subjects stated that they felt “fine” or “good” after imaging when asked “How did you feel during the study?” Postimaging interview revealed that 3 (16%) subjects had transient dizziness upon entry; 2 (11%) felt transient vertigo upon entry; 8 subjects (45%) reported that they almost fell asleep while in the magnet; one subject (6%) had an episode of vomiting after the scan when outside of the magnet. No other abnormal sensations were reported in this group. Forty (62%) of 65 patients stated “fine” about this procedure after imaging when asked “How did you feel during the study?” Postimaging interview revealed transient vertigo or dizziness upon entry in 7 (11%) subjects; coldness in 4 (6%) subjects; feeling of being “tight” or “trapped” in 3 (4%) subjects; and tolerable “warmth” in 3 (4%) subjects. Two (3%) subjects stated that they felt “uncomfortable” on the table and/or in the head coil; only 2 (3%) subjects in this group felt sleepy. Other comments included vibration, 1 (2%); metal taste in mouth, 1 (2%); and anxiety, 1 (2%). Previous studies performed on an 8T human MR system have provided experience that was incorporated into the current study.17-19 These included slow entry and exit of subjects in and out of the magnet, simplified core body temperature and ECG measurements, and hearing protection. This experience may have reduced potential subject discomfort and improved reproducibility of vital sign measurements. After imaging, however, some subjects still reported transient nausea, vertigo, and unusual metallic taste in the mouth, especially upon the entering and/or exiting of the magnet. These phenomena have been reported since the introduction of first 4T system, as well as previous normal subject studies on 8T, and have been found to disappear rapidly after subjects leave the magnet.10,23 The mechanisms of these phenomena are based on the influence of induced magnetohydrodynamic (MHD) forces on the inner ear and electric currents introduced on the surface of the tongue.23 In general, these phenomena should be regarded as unavoidable, though they can be minimized, and patients should be given detailed explanation before imaging to alleviate any anxiety associated with these sensations. Two subjects vomited immediately after scanning. Had vomiting occurred during scanning, aspiration would have occurred. If a subject is found to be experiencing significant nausea while in the scanner, the imaging procedure may need to be terminated immediately and the subject carefully removed from the magnet to avoid such a circumstance. RF power is the major source of heat generation during the MR procedure. Most RF power is transformed into heat within tissues as a result of resistive losses.14,15,24-26 The dosimetric term used to describe the absorption of RF radiation is SAR, which is defined as watts per kilogram of body weight. The SAR is a complex function of numerous factors, such as frequency, retention time (TR), and type of coils and also interacts with the subject’s thermoregulatory system.27 Many human and animal studies have considered the influence of RF power on skin temperature, HR, oxygenation saturation, blood pressure, and cutaneous blood flow in various MR systems.24-26,28-32 As early as 1987, Shellock studied temperature change in 15 patients on a 1.5T MR system (64 MHz) and found that body temperature increased an average of 0.2°C after imaging the trunks by using a body coil. There was, however, no significant correlation between body temperature changes with whole body average SAR between 0.42–1.2 W/kg. The skin temperature change, however, was much more variable depending on different body sites with a modest correlation with SAR.25 In another study, when the whole-body-average SAR was raised to 6 W/kg, statistically significant increases on both core body and skin temperature were found. No physiologic changes, however, were considered deleterious to the study subjects in either study.30 It was initially hypothesized that the existence of inhomogeneous distribution of RF power at a frequency of 340 MHz used for 8T MR imaging might create higher temperature in deeper regions than peripheral tissues. After measuring temperature changes in multiple positions in a head phantom by using a 16-strut TEM coil on 8T, Kangarlu et al found a linear correlation between RF power and temperature increases and reported that the maximum temperature change with the most powerful RF pulse of SAR at 4W/kg for 10 minutes was an increase of only 0.7°C.20 This study demonstrated that there were no regions of heating that exceeded the FDA guidelines. As mentioned earlier, the SAR of the GRE and RARE methods in the current study were 0.086 W/kg and 0.95 W/kg, respectively, falling within the FDA limits of 3 W/kg.21 No statistically significant change in core body temperature was found in the current study. This phenomenon may be accounted for on the basis of the normal human thermophysiologic responses to heat, which depend on multiple physiologic, physical, and environmental factors. With regard to self-regulation, thermal challenge by RF power can be dissipated by convection, conduction, evaporation, and radiation. In addition, the environmental condition might play an important role in regulation of such effects.14 Under the same environmental condition and applied temperature measurement method, our in vivo study results did not show notable temperature change in either normal subject or patient group. Among the 3 patients who felt warm during imaging, only one was found to have a temperature increase from 97.8°F to 98.6°F. The other 2 showed a drop of 0.4°F after scanning. As for subjects who reported feeling cold, there were no changes before and after imaging. As such, it is concluded that RF power did not have a significant impact on subjects’ thermal regulation system in the present short-term imaging procedures under the FDA guideline. Another risk in the MR procedure is the effect of rapid time-varying gradient magnetic field strength, which may induce an electric current and change neurologic and muscular activities in the target areas.11-13 This effect is related to the perception threshold in different tissues and the directions of gradient fields. Schaefer et al have thoroughly reviewed this effect on physiologic vital signs.13 Although different investigators used different terms to describe the gradient-induced stimulation, related symptoms included subjective discomfort, peripheral nerve pain, and life-threatening ventricular fibrillation. It was regarded that these symptoms resulted from the strength of the stimulation and the subject’s pain threshold.33,34 Current MR safety standards, however, have succeeded in keeping time-varying fields below the level of concern while not sacrificing diagnostic advantages of the gradient field.35,36 The gradient field fluctuations used in the 8T system also fall well within these limits. With the application of an asymmetric head gradient set, the gradient-induced stimulation was delivered only above the neck.22 The only 2 complaints of discomfort focused on the placement of the head in the narrow space of coil throughout the procedure rather than upon application of the time-varying gradients. Similarly, other complaints such as feeling of tightness and being trapped or vibration were also not attributable to time-varying gradients. It is intuitive that new coil and table designs may improve patient comfort. Because the intent of scanning normal subjects and subjects in the disease group differed, the total MR duration in the normal group was almost 2 times that of the patient group. This prolonged period in the magnet while in a supine position may have a sedative effect.37 Indeed, our normal subjects were all healthy individuals, and almost half (45%) of them reported sleepiness. It should be no surprise that this sedative effect may have influenced cardiovascular autoregulation in such a way as to result in a mild decrease in HR. Prior studies assessing the influence of MR imaging systems on blood pressure at different MR field strengths and SAR have demonstrated a statistically significant slight increase in SBP or MAP. These changes, however, were too small to be detrimental to the subjects.17,25,29,30 In addition, no evidence of hemodynamic alteration related to SAR from 0.42 to 1.2 W/kg has been shown.25 In 2003, Chakeres et al17 monitored the vital signs in 25 normal subjects exposed to different static magnetic fields from 0 to 8T and found only the SBP significantly increased 3.6 mm Hg, which had no clinical significance. Blood pressure changes in this study supported these findings. It is not clear what can account for this slight elevation in SBP. It would be expected that at rest (supine position) blood pressure should increase slightly over time.37,38 Hypothetically the strong magnetic field may have a resistive effect to the flow of blood as a result of iron content in the blood. Indeed, a tendency for erythrocytes to align themselves with the magnetic field has been shown, which could conceivably result in resistance to flow.39 This hypothesis is not supported by invasive cardiovascular measurements performed on fully anesthetized swine. It is known, however, that anesthesia may have depressed cardiovascular function, which may explain this discrepancy.19 In the present study, DBP, MAP, and pulse oxygen saturation of 2 normal subjects displayed substantial changes at the last collection time point while in the magnet (Fig 1). These particular vital signs changes were transient and not associated with any symptoms. Although not detrimental to the subjects, it would be reasonable to limit the duration of 8T MR imaging procedure to within 90 minutes until additional data are collected beyond this time period. Artifact on ECG has been found to increase as static magnetic field increased from 0 to 8T.16 This phenomenon can be explained by the MHD effect. Blood acting as an electrically conductive fluid can induce a current in the presence of a sufficiently strong static magnetic field. The currents produced are detected on the ECG tracing resulting in artifact.18,19,23 Because the distortion of ECG would make interpretation impossible if measurements were performed while subjects were inside the magnet, ECG was measured only while the subjects were outside the magnet. When rhythm strips before and after scanning were compared, no significant differences were found. In summary, the current short-term neurologic MR imaging procedure at 8T UHF in humans has no adverse effects on major physiologic vital signs in either normal subjects or patients. Small changes in blood pressure and HR measured in this study were not enough to have a substantial impact on the subjects. Because nausea and vomiting occurred after the scanning procedure in 2 of 92 subjects, consideration should be made to remove an individual from the magnet if they are experiencing nausea and vomiting to reduce the risk for aspiration. Most transient sensations reported by subjects such as anxiety, warmth, and coldness were similar to experiences reported at lower field strengths. Feeling of dizziness and vertigo and metallic taste were reported with a greater frequency than previously observed at 1.5T. Nonetheless, as an increasing number of UHF human MR systems become commercially available, it is likely that more patient-friendly imaging environments and coil designs will emerge. These will act to make the imaging procedure more patient friendly while maintaining scanner operation within FDA safety guidelines. It is hoped that patient monitoring will become integrated as a design feature of these systems, such that these examinations can continue to be monitored with the level of safety that is necessary. For their support in the completion of this work we thank Pierre Marie Robitaille, Donald W Chakeres, and Petra Schmallbrock. This study was supported by NCI grant R21CA/NS92846-01A1. This manuscript was presented at the 43rd annual conference of American Society of Neuroradiology, May 21–27, 2005, Toronto, Ontario, Canada. Accepted after revision August 30, 2005.